Air exerts pressure. Air pressure decreases as altitude increases. Forest fires and volcanic eruptions are two natural processes that affect Earth’s atmosphere. 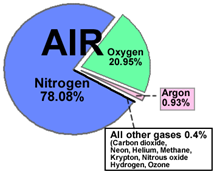 Many gaseous compounds and particles are released into the atmosphere by human activity. All of the effects of these materials are not yet fully understood. Clouds are important indicators of atmospheric conditions. 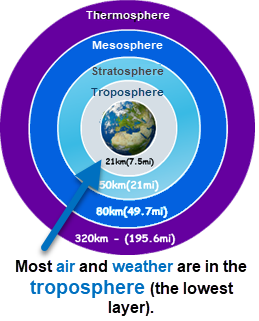 Clouds are found at various levels within the troposphere. Three major types of clouds are cumulus, stratus, and cirrus. Ozone, a form of oxygen, can form near the surface when exhaust pollutants react with sunlight. This pollutant can cause health problems. Naturally occurring ozone is also found in the upper atmosphere and helps to shield Earth from ultraviolet radiation. Maintaining good air quality is a crucial goal for modern society, and it is everyone’s responsibility to work toward it. 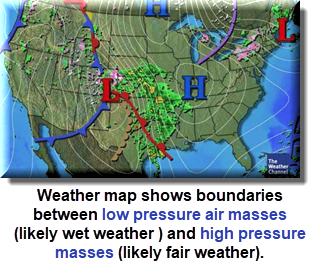 Weather maps show much useful information about descriptive air measurements, observations, and boundaries between air masses (fronts). The curved lines showing areas of equal air pressure and temperature are key features of weather maps. Weather maps are important for understanding and predicting the weather. analyze and interpret charts and graphs of the atmosphere in terms of temperature and pressure. evaluate their own roles in protecting air quality. design an investigation to relate temperature, barometric pressure, and humidity to changing weather conditions. 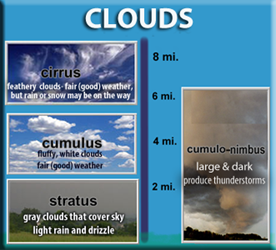 compare and contrast cloud types and relate cloud types to weather conditions. compare and contrast types of precipitation. compare and contrast weather-related phenomena, including thunderstorms, tornadoes, hurricanes, and drought. map the movement of cold and warm fronts and interpret their effects on observable weather conditions.